Second albums are never easy. Some go experimental, some go heavy, some go acoustic and some bands never even make it all the way there. Canadian Arcade Fire's debut album, "Funeral", painted a bleak-yet-hopeful picture of a neighbourhood in which the kids knew all the things that went on behind closed doors, and dreamed of leaving the snow, the cold and their parents. 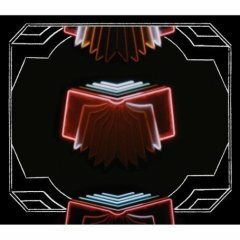 "Neon Bible" is the second album from th' Fire, and it marks an evolution for the band, if the themes remain roughly the same; Love, escapism, a feeling of being trapped and all that sentimental stuff. As a band that always used to look as if they were about to attend a funeral, wearing their father's best suit, the music is smitten with a certain gloom, a light darkness that puts its mark on the songs. From opener "Black Mirror" to closing number/barrage of noise "My Body is a Cage", "Neon Bible" is most of all a very different experience to most rock albums that have been released this year. Hell, it's different to most albums released the last five years. Most likely, that's what makes it so great. This is a great album. From quaint title-track "Neon Bible" through Bruce Springsteen-y "(Antichrist Television Blues)" it's an album that focuses on the desires most people experience at some point or another, the idea that life is (in essence) pretty horrible when you look at it, but that you can rise above your station. "Intervention" adds a massive church organ to a song that reaches holy spectrums in the closing minute, "Ocean of Noise" bangs out joy with its orchestral sequences and it is all, every single second, good. Another point that just gives this album more credit is that when listening to it, the listener (or I am anyway) infected by a weird sense of glee. You know, the type of joy that makes you want to jump down the street, singing along to every verse and chorus Arcade Fire shout out over the accordions, the pianos, the guitars and violins. "Neon Bible" features near flawless production, taking the band's sound to a soft and deep place where all the instruments they use come forward in their own right. Everything from small bleeps from a synth to a massive church organ is present without ever drowning the in cacophony. Furthermore, there are no bad songs on the album. None. The only reason "Neon Bible" doesn't recieve a 10/10 is that I believe the Arcade Fire can do even better, that singer Win Butler, violinist Owen Pallett/Final Fantasy and that weird ginger guy with the drum can reach even further into hope, imagination and pure talent and bring out a collection of songs that takes the listener to an even more special place.